A collection of blog entries taken from "The Daily Walk"
Internationally acclaimed 7 string guitarist/singer/songwriter "The Commander In Chief" started a blog in 2015 after requests from her fans. 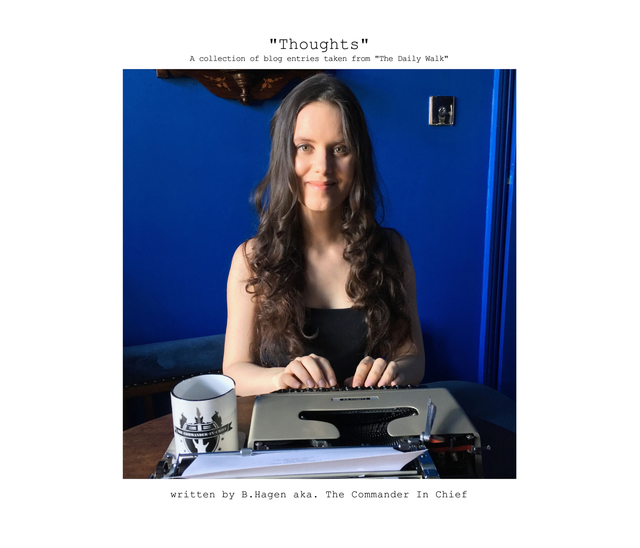 "Thoughts" is her 1st Blog book containing selected entries from her 1st two years of blogging. She writes about politics and books, and shares her observations and opinions covering many topics. This book also features photographs taken by the artist herself. She has previously authored and illustrated a children's book called "The Freezing Snowman," and an illustrated lyric book called "The Commander In Chief Lyric Book," both releases reached bestseller status on Amazon. 7 String guitarist, singer, songwriter in rock'n'roll & classical crossover. Amazon bestseller, "Queen Of Shred," featured in countless heavy metal & guitar magazines worldwide. Featured on BBC3, BBC6 & numerous national tv-shows in her home country of Norway.